Albert Pujols is a phenom. 10 years into his career he has already broken the 400 mark in homers, he has driven in more than 1200 runs and has maintained a batting average of .331. The closest player comparisons to him are men who inhabit the baseball pantheon–Frank Robinson, Lou Gehrig, Ken Griffey. But there’s more to Pujols than his dominance of the game of baseball. He is also a committed Christian who seeks to submit all that he does to the Lord. 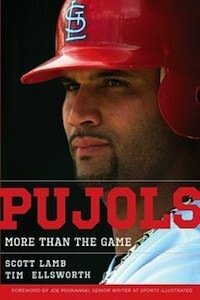 Pujols happens to be the subject of Pujols: More Than The Game, a new biography written by Scott Lamb and Tim Ellsworth. A baseball player’s career on the field is easily tracked by numbers. Statisticians have found innumerable ways of measuring and dissecting every component of the game, from the plate to the field to the base paths and everything in between. A man’s entire career can be distilled to a handful of numbers–a few lifetime statistics followed by a number that represents his career earnings. And then he retires and gets old and is forgotten, replaced by the new young superstars. What cannot be easily measured is his impact on those around him–his family, his teammates, his fans. What is special about Pujols is his desire to be an example not just in his statistics but in his life and his legacy. He is seeking to build a legacy not just of phenomenal numbers, but of gospel impact. Born in poverty in the Dominican Republic, Pujols immigrated to the United States at 16 and immediately began to dominate the game of baseball, first in high school and then in college. Drafted by St. Louis, he spent just one year in the minor leagues before graduating to the big show where he quickly won Rookie of the Year honors (batting .329, hitting 37 homers and knocking in 130 runs; amazingly, that was to prove his weakest season). And he was just getting started. He has played for the All Star team in 9 of his 10 seasons, has won a World Series and has taken home MVP honors 3 times. And heading into his eleventh season he is only 31–just getting warmed up. However, while Lamb and Ellsworth provide many examples of Pujols saying things like “I do everything to glorify God,” they do not offer a lot of fascinating examples of him doing that. But I think that’s okay, because at the end of the day Albert Pujols isn’t a whole lot different than you or me. He can hit a baseball like few other men and he gets paid vast amounts of money to do so. But at the end of it all, he leads a pretty normal life and does pretty normal things in it. I don’t find his life a whole lot more inspiring than the life of any other brother or sister in Christ. His career and fame have brought him a few unique opportunities, but the scale of his response does not seem to be above and beyond (which is to say that 10% of a $100-million contract is still just 10%–no more than the Lord requires). In that way he does not strike me as a true sports hero in the vein of an Eric Liddell. He’s a normal guy who has an extraordinary talent in a game that offers an unbelievable amount of money and fame. It must be noted that this biography comes early in Pujols’ life and career. Though he has already established himself as a superstar and as one of the all-time greats in the game, he is only 31 years old and should have another 8 or 9 years of production left in him, including what may be some of this best seasons. And even then he will be only 40 years old with a lot of living left to do. That makes this a very different biography from, for example, James Hirsch’s excellent biography of Willie Mays. And it makes it very different from Andre Agassi’s Open, an autobiography that offers a career retrospective–to draw comparisons to a couple of recent bestsellers in the same genre. This book is a wee bit formulaic (many of the chapters follow a very similar pattern, mostly notably those that lead the reader through a season of baseball) and it is occasionally a bit melodramatic (“But for the man at the plate wearing jersey number 5, the ‘perfect opportunity’ pitch was the delivery he looked for, the delivery he knew would come. Only then would he swing his maple bat in an arc of geometric beauty and poetic power.”). But it’s well-written and, for this baseball enthusiast, an interesting read. Pujols is a baseball player and a Christian. This biography is likely to appeal largely to those who love Christ and (not or) those who love baseball. Being a fan of Pujols or the Cardinals will make it even more enjoyable. The season-by-season descriptions of Pujols’ feats are interesting to baseball fans, but will not play so well with those who who have no love for the game. More Than the Game stands as an interesting description of the first couple of acts from the life of Albert Pujols. I’ll look forward to seeing how this story progresses in the years and decades to come.